An overview of all the databases registered in the platform. The last database uploaded is on the first line of the table. The dynamic filling system is doable for every column. A click on the header allows the user to organize the table according to this information. A search function is also available to classify the resources. General information presented in a table. The column’s headers are : Language, Name, Authors and co-authors, Subjects and Key-words, Type, Lines, Sites, Scale, Starting date, Ending date, State of work, Scope, License and Description. After login in, the user can have access to these information about the databases on ArkeoGIS. A click on the database’s line in the table allows the user to consult the information sheet about this database. For instance, here is a full database sheet. The table below presents an extract from this database index. If the authors/working groups have not provided metadata for their project, it will appear under the name of the person who imported it. This will of course be corrected as soon as the project metadata is received. fr Verduron et sites contemporains Loup Bernard Verduron, Marseille grecque, Celtes méridionaux, IIIe s. av. J.-C. Research 21 3 Site -300 -26 In progress Country CC-BY-NC Verduron et sites contemporains fouillés autour de Marseille grecque au IIIe s. av. J.-C.
fr Barbau 2019 Objets italiques en Gaule Lizzie Scholtus - Clémentine BARBAU Petit mobilier, mobilier italique, Gaule Research 968 114 Object -360 450 Finished Country CC-BY-NC-SA Durant les deux derniers siècles avant notre ère, des objets de type italique, c’est-à-dire caractérisant la culture matérielle de l’Italie tardo-républicaine apparaissent progressivement en Gaule. L’identification de ces objets du quotidien et leur analyse typologique et contextuelle permettent une approche renouvelée du phénomène de romanisation de la Gaule. L’objectif de cette étude est de mettre en exergue les modalités chronologiques, spatiales et culturelles de la diffusion de ce type de mobilier. La confrontation des résultats avec les données issues des études céramologiques et architecturales permet de brosser un tableau affiné du processus d’acculturation. La prise en compte de la nature des sites, ainsi que de la diversité des types d’objets considérés, permet de souligner la variété des comportements des populations locales face à la réception de ces mobiliers exogènes. Que ce soit dans le commerce ou en intégrant l’armée romaine, les élites locales ont joué un rôle majeur au sein des interactions avec l’Italie, mais aussi pour la diffusion de ces objets et l’intégration des nouveaux modèles italiques. fr ADAB_2011_Sud Jean-Philippe Droux Adab sud Inventory 1594 1590 Site -3000000 1999 In progress Country CC-BY-NC-SA In der Datenbank ADABweb sind im Sommer 2009 rund 170.000 Objekte der Archäologie und der Bau- und Kunstgeschichte eingetragen. Der Erfassungsstand variiert in den einzelnen Landkreisen. Kombiniert werden die Kulturdenkmale mit den Daten der Automatischen Liegenschaftskarte, topographischen Karten in unterschiedlichen Maßstäben, landesweiten Orthofotos der Landesvermessung, den so genannten Urnummernkarten, das heißt den ersten Flurkarten aus dem 19. Jahrhundert, die zurzeit digitalisiert werden. Auch externe Datenquellen können per WMS/WFS eingebunden und visualisiert werden. Außerdem sind mehr als 40.000 digitalisierte Pläne und Gebäudegrundrisse aus dem Planarchiv der Denkmalpflege digital recherchierbar. Seit Februar 2009 werden sukzessive die Bilder des Luftbildarchivs des Landesamtes für Denkmalpflege digitalisiert und im Kontext zum jeweiligen Objekt direkt zugänglich gemacht. Ergebnisse von archäologischen Ausgrabungen (Grabungspläne) werden nach und nach eingebunden. Der Verbleib der Funde im Zentralen Fundarchiv Rastatt (ZFA) wird durch die Kombination zweier Datenbanken - Esslingen (LAD) und Rastatt (ZFA) - in ADABweb nachgewiesen. fr ADAB_2011_Nord Jean-Philippe Droux - Erich Lieb ADAB Nord Inventory 4166 4159 Site -3000000 2016 Finished Country CC-BY-NC-SA In der Datenbank ADABweb sind im Sommer 2009 rund 170.000 Objekte der Archäologie und der Bau- und Kunstgeschichte eingetragen. Der Erfassungsstand variiert in den einzelnen Landkreisen. Kombiniert werden die Kulturdenkmale mit den Daten der Automatischen Liegenschaftskarte, topographischen Karten in unterschiedlichen Maßstäben, landesweiten Orthofotos der Landesvermessung, den so genannten Urnummernkarten, das heißt den ersten Flurkarten aus dem 19. Jahrhundert, die zurzeit digitalisiert werden. Auch externe Datenquellen können per WMS/WFS eingebunden und visualisiert werden. Außerdem sind mehr als 40.000 digitalisierte Pläne und Gebäudegrundrisse aus dem Planarchiv der Denkmalpflege digital recherchierbar. Seit Februar 2009 werden sukzessive die Bilder des Luftbildarchivs des Landesamtes für Denkmalpflege digitalisiert und im Kontext zum jeweiligen Objekt direkt zugänglich gemacht. Ergebnisse von archäologischen Ausgrabungen (Grabungspläne) werden nach und nach eingebunden. Der Verbleib der Funde im Zentralen Fundarchiv Rastatt (ZFA) wird durch die Kombination zweier Datenbanken - Esslingen (LAD) und Rastatt (ZFA) - in ADABweb nachgewiesen. fr Brotschberg_2017 Steeve Gentner Brotschberg, Habitat, Mobilier, Prospection Research 45 44 Object -6500 1600 Finished Country CC-BY-NC Results of surveys conducted in Haegen - Brotschberg - (67, Bas-Rhin) in June 2017.
fr Cours cartes de confiance Charlène Morel Alsace, Carte de confiance, Cours Research 150 149 Site -6500 1491 Finished Country CC-BY-NC-SA Database created only for teaching purposes, don't use it ! 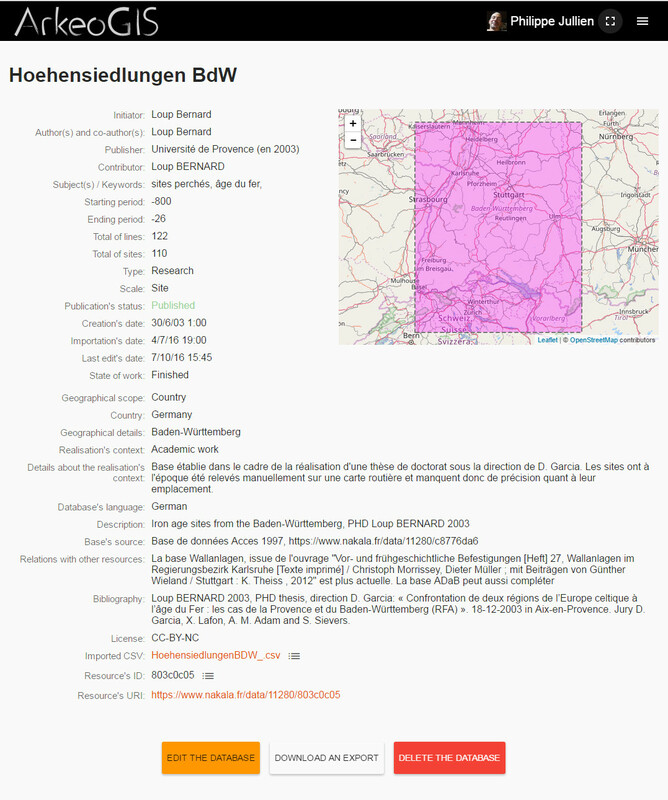 fr Sites de métallurgie du fer en Lorraine Alexandre Disser Archéométallurgie, alliages ferreux, Lorraine Research 1387 503 Site -800 2016 In progress Country CC-BY-NC-SA Database established within the frame of the research program led on archaeometallurgy of iron in Lorraine under the supervision of Marc Leroy (LMC IRAMAT-UMR 5060). fr CMorel_Thèse_Alsace Charlène Morel Géoarchéologie, Kochersberg, Loess, Longue durée Research 1849 465 Micro-region -6500 1500 Finished Country CC-BY-NC This database results from the compilation of Strasbourg’s Service Régional de l’Archéologie’s data. It’s part of a PhD research (at the University of Strasbourg) which aims to study human settlement on loess in the Kochersberg (Alsace, France) between the Neolithic (5000BC) and the 15th Century. All the sites haven’t been selected for the study. Those which couldn’t bring the necessary information have been removed. That includes: off site data, unlocated sites, sites with no datation or function, inconclusive surveys and some hoards. fr Inventaire d'ouvrages miniers "anciens" Luca Banchetti - Alexandre Disser Activités minières, Ages des métaux, Antiquité, fer, argent, or, cuivre. Research 792 292 Site -2200 2016 Finished Country CC-BY-NC-SA Inventory created in 2008 and relying on the informations given by the CAG book series, PATRIARCHE (Ministry of Culture database) and yearly newsletter of the SAFEMM association. de SHKR Franziska Faupel - Oliver Nakoinz Eisenzeit SHKR Research 9849 9848 Site -2200 580 Finished Country CC-BY-NC Iron Age SHKR, modified for ArkeoGIS. Some coordinates have been altered, and some sites are not present. Please check also original SHKR file. fr Prospections_Bruno_Baudouin_Riez Luca Banchetti - Bruno Baudoin Prospection, Alpes de Haute-Provence, territoire de Riez, Reii Research 558 557 Site -6500 1789 Finished Country CC-BY-NC-SA Database based on the thesis of B. Baudoin "The city of Riez and its territory". fr Marseilleveyre_2012_Delphine_Isoardi Loup Bernard - Luca Banchetti - Sophie BOUFFIER - Delphine Isoardi Prospection, Marseilleveyre, Céramique Research 49 45 Object -6500 1789 Finished Country CC-BY-NC-SA Database concerning prospections of S. Bouffier and D. Isoardi. In the case of survey data, all sites are to be requested in "furniture / ceramics". fr Florence-Mocci_Prospections_Verdon_2003-2006 Luca Banchetti - Florence Mocci Verdon, prospections, habitat Research 86 85 Site -6500 1789 Finished Country CC-BY-NC-SA Based on prospecting conducted by D. Garcia and F. Mocci. In the process of import, all the sites are filled in as "habitats", the detail of the inventory is in field "remarks. fr Florence_Mocci_Verdon_1998 Luca Banchetti - Florence Mocci Verdon, Prospection, habitat Research 39 35 Site -6500 1789 Finished Country CC-BY-NC-SA Base corresponding to the surveys of 1997. The detail of the sites is in remark, in the state most of the sites appear as "habitat". fr Florence_Mocci_Archéo_Ecrins Luca Banchetti - Kevin Walsh - Florence Mocci Prospection, Néolithique, Ecrins, Moyenne et haute montagne Research 118 117 Site -6500 1789 Finished Country CC-BY-NC-SA This base is the result of prospecting and excavation in the middle and high mountains (1800-2700 m) under the direction of F. Mocci (CCJ, UMR 7299) and K. Walsh (University of York) between 2000 and 2013.
fr Arkeogis-v4_Merlan_Grégoire_2015 Luca Banchetti - Grégoire Merlan Métallurgie, Fer, Scories, Gaule Méridionale Research 631 279 Site -6500 679 Finished Country CC-BY-NC-SA Database conducted as part of a master research on iron metallurgy in southern Gaul. fr Arkeogis v4_Alexandre_Disser_2008 Luca Banchetti - Alexandre Disser Métallurgie, France, mines, fer, or, argent, cuivre Research 789 290 Site -6500 1199 Finished Country CC-BY-NC-SA Inventory of mining extractions listed in the CAG in 2008. Master's thesis under the direction of L. Bernard "Development of a methodology for the dating and characterization of ancient mining works, 2008, 2 vols. fr Bronzes méridionaux en rapport avec le launacien Luca Banchetti Bronzes, Premier âge du Fer, Launacien, Funéraire, Habitat, Production Research 909 904 Site -6500 486 Finished Continent CC-BY-NC-SA The inventory presents the so-called "daily" bronzes of the early Iron Age in the broad sense (including a fringe of hinterland and Catalonia) in relation to the phenomenon of the Launacien, but in all other archaeological contexts. fr Féliu_thèse_2008 Clément Féliu Age du Fer, La Tène moyenne, La Tène finale, habitat, funéraire, Leuques, Médiomatriques, fortifications, oppidum Research 1181 408 Site -460 449 Finished Continent CC-BY-NC-SA This database takes up the catalog of my doctoral thesis on the "Leuques et Médiomatriques à La Tène moyenne et finale". It consists mainly of settlements, which have been the subject of a detailed study, necropoles, and other site indices. fr Sites_bassin_versant_Anapodaris Quentin Drillat Sites archéologiques, bassin versant de l'Anapodaris, Messara, Crète, Grèce Research 190 134 Site -1430 330 Finished Country CC-BY-NC-SA Catalog of archaeological sites in the Anapodaris catchment (Crete, Greece) between Late Minoan II and Roman period, carried out as part of a Master's research. fr MedMax. Mediterranean future sea level Maximum Loup Bernard - Matteo Vacchi radiocarbon dated Relative Sea-Level (RSL) Research 649 648 Site undetermined undetermined In progress Continent CC-BY-NC The first quality-controlled database constraining the Holocene sea-level histories along the Spanish, French, Italian, Slovenian, Croatian, Maltese and Tunisian coasts. In the framework of the MedMax project, we completed the review of 909 radiocarbon dated Relative Sea-Level (RSL) data-points along the western Mediterranean coast. fr Tremblay Cormier 2013 Laurie Cormier Mobilier métallique, typologie, Bronze final IIIb, Hallstatt, premier âge du Fer Research 14054 14053 Object -1350 -431 Finished Country CC-BY-NC This database is issued from a PhD defended in 2013 at the Université de Bourgogne, concerning cultural identities and exchanges in an area covering north-eastern France, western Switzerland, south-western Germany and Luxemburg. It contains an exhaustive collection of metal objects from Ha B2/B3 (BFIIIb) to Ha D3 (Ha final), without any distinction of archaeological context. The records are linked to the catalogue, which is now published in a monography at the Éditions Universitaires de Dijon. fr Tombes de l'élite du Ha ancien en France Laurie Cormier Élite, épées, vaisselle métallique, harnachement, tumulus, Hallstatt, premier âge du Fer Research 679 676 Site -800 -620 Finished Country CC-BY-NC-SA Database issued from a synthesis of French elite burials, presented during the International Workshop of Leiden and Hamburg Universities "Connected Elites and Regions in the Early Hallstatt Period" in Leiden (19-20 novembre 2015). Selection criteria: weaponry, metallic vessel, harnesses, wagon pieces and/or gold objects. Two information levels: site (grave) and objects. fr Hydromed_Monde grec oriental Luca Banchetti - Sophie BOUFFIER Hydromed, monde grec oriental, aménagements hydrauliques, puits, citerne, latrine Research 219 218 Site -500 14 Finished World CC-BY-NC Database on hydraulics layouts in the Eastern Greek world (for the moment, Délos, Albania, Alexandria) as part of the Hydromed project. fr Roscio 2011 Laurie Cormier - Mafalda Roscio âge du bronze, funéraire, bronze final, typologie Research 5720 1558 Site -1350 -1051 Finished Country CC-BY-NC Database issued from a PhD on the beginning of the Early Iron Age between the Parisian basin and Swabian Jura. The data is sorted by sites and graves, with a more precise description in the comments. fr Archéométallurgie des bronzes hallstattiens Laurie Cormier Bronze, Archéométallurgie, Composition élémentaire, Parure annulaire Research 142 141 Object -725 -461 Finished Country CC-BY-NC This database is issued from a two-years post-doctorat which started in October 2014, financed by the F. Thyssen foundation and hosted by the RP Stuttgart, on the Early Iron Age bronze archaeometallurgy in the Upper Rhine Valley. The elementary composition of 64 regional ring ornaments and 3 metallurgical remains has been conducted in collaboration with B. Mille, in the C2RMF, using the PIXE method. The results of this study have been published in the following article: L. Tremblay Cormier / B. Mille, Étude archéométallurgique de parures hallstattiennes en alliage cuivreux du Rhin supérieur. Bulletin de la Société Préhistorique Française 2016, 113/4, 785-808.
fr Hydromed_Espagne Luca Banchetti - Sophie BOUFFIER HYDROMED, Espagne, aménagements hydrauliques, citerne, canalisation Research 130 128 Site -1000 14 Finished Country CC-BY-NC Data base on hydraulics layouts of the first millenium BC for the HYDROMED project. fr Atlas des Sites du Proche-Orient (ASPRO) Jean-Philippe Droux Atlas des Sites du Proche-Orient (ASPRO), Epipaléolithique, Néolithique, Chalcolithique Research 3238 1783 Site -16300 -4201 In progress World CC-BY-NC-SA ASPRO is a database including about 2000 Near East archeological sites occupied between 16 000 and 4 200 BC. fr Hydromed_Gaule méridionale Luca Banchetti - Sophie BOUFFIER Hydromed, Gaule méridionale, aménagements hydrauliques, évacuation Research 174 173 Site -600 14 Finished Country CC-BY-NC Data base on hydraulics layouts in Southern Gaule during the first millenium BC for the HYDROMED project. fr Hydromed_ Monde grec oriental Luca Banchetti - Sophie BOUFFIER Hydromed, monde grec oriental, aménagements hydrauliques, puits, citerne, latrine Inventory 114 113 Site -500 14 In progress Continent CC-BY-NC Data base of hydraulics layouts in cities of oriental greek world for the Hydromed project. fr Habitats_Ruraux_HAD2-LTC1 Charlène Morel - Muriel Roth-Zehner Alsace, Habitats ruraux, Age du Fer Research 289 170 Site -620 -201 Finished Country CC-BY-NC Muriel Roth-Zehner's database displaying the settlements in the Rhine valley between the Hallstatt D2 and the La Tène C1 periods. fr Habitats_LTC2-Augustéen Charlène Morel - Muriel Roth-Zehner Habitats, Alsace, La Tène, Age du Fer, Période augustéenne Research 70 47 Site -200 36 Finished Country CC-BY-NC-SA Muriel Roth-Zehner's database about the settlements in the Rhine valley between La Tène C2 and the Augustean Period. fr Schneider-2013 Charlène Morel - Nathalie Schneider Sols, Analyses, Formations superficielles Research 120 108 Site -6500 2016 Finished Country CC-BY-NC-SA Analyses des sols et des formations superficielles. fr ALISA Charlène Morel - Martine Trautmann Analyses, Sols, Formations Superficielles Research 438 132 Site undetermined undetermined Finished Country CC-BY-NC-SA Soils and surface geological analysis by Martine Trautmann from EOST, UMS830, CNRS/UdS. fr Suisse_habitats_Carrard Loup Bernard - Frédéric Carrard Suisse Habitats La Tène Research 261 244 Site -800 449 Finished Country CC-BY-NC Sites (et plus particulièrement habitats) du second âge du Fer en Suisse (base de données de Fr. Carrard). fr Glas_Wagner_2006 Loup Bernard - Heiko Wagner verre, La Tène, bracelet, Schmuck, Glas, Baden-Württemberg Book's transcript 220 145 Site -800 449 Finished Country CC-BY-NC-SA Base issue de l'ouvrage de Heiko Wagner : Glasschmuck der Mittel- und Spätlatènezeit am Oberrhein und den angrenzenden Gebieten (= Ausgrabungen und Forschungen. Bd. 1). Greiner, Remshalden 2006, ISBN 3-935383-02-9 (Zugleich: Freiburg (Breisgau), Universität, Dissertation, 1998). fr Hoffmann_2007 Charlène Morel Inventaire, Allemagne Book's transcript 428 254 Site -6500 2016 Finished World CC-BY-NC-SA G. Hoffmann, Spuren Früher Zeiten, Funde und Fundstatten im Landkreis Rastatt, Verlag Regionalkultur, 2007.
de Hoehensiedlungen BdW Loup Bernard sites perchés, âge du fer, Research 122 110 Site -800 -26 Finished Country CC-BY-NC Iron age sites from the Baden-Württemberg, PHD Loup BERNARD 2003.